Retired Greyhounds as Pets make fast friends! Thank you for your informative and important site. 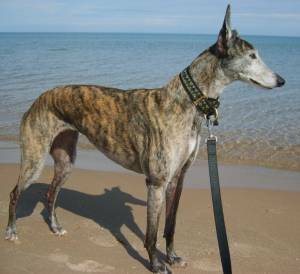 I am passing it on to our Board at Michigan Retired Greyhounds as Pets (MI REGAP). I've been a volunteer in several core capacities at MI REGAP since 1997 and have been in awe of the tireless work by our founder Leslie Forys and the army of "core" team members who meet haulers in the middle of the night who bring us greyhounds who made it mercifully off the track alive!!! These dogs know they are safe because of the gentle hands, soft voices and a warm bath before they are welcomed by one of our generous Foster Home families. We have Teams that run Rescue, Adoptions & Foster Homes, Medical, Advocacy, Fundraising, Meet & Greets, and more. We have had 35 dogs at a time and our "Matching" team reviews every applicant to see what dog in our REGAP Family would be a fit in the human family. We have fundraisers that bring our Adopters, friends and supporters together in fun and creative ways... all inbetween our own family and work committments.. all because of the passion to save the ex-racing greyhound and to eventually end this needless bloodsport. Join in and write your own page! It's easy to do. How? Simply click here to return to Nominate Animal Charities.